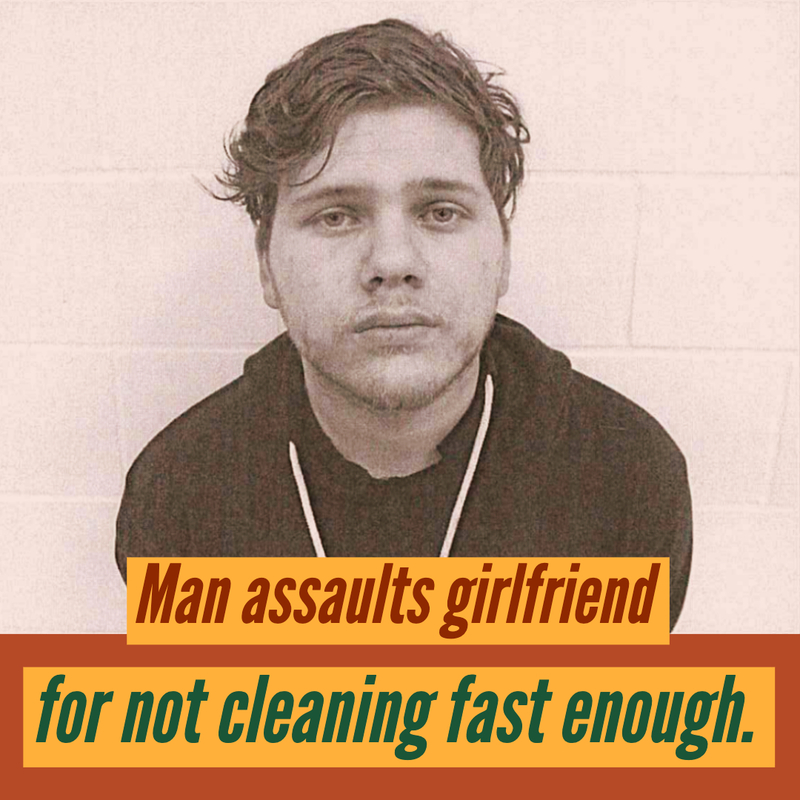 The victim told police that her boyfriend had punched her twice because “was not cleaning quickly enough”. On Friday, April 5 at approximately 10:30 p.m. Sapulpa Police Officer Elisa Mudd was dispatched to a residence on Gail Lane to investigate an assault complaint. Upon arrival, Officer Mudd made contact with the victim, R.S. The Victim advised that she and her boyfriend, Clayton Hunter Dunn (Defendant), have been in a dating relationship for the past three years and reside together in the home on Gail Lane. R.S. said she was cleaning the kitchen floor when the Defendant punched her twice in the right temple with a closed fist. She stated that she was attacked because she was not cleaning quickly enough. After being punched, the Victim stood up and got into a small physical altercation with the Defendant. She stated that after the altercation he left the residence on foot. Officer Mudd observed that R.S. redness and swelling on and around her right temple. Later Mudd was able to make contact with the Defendant at Tracie Lane and Sherlyn Lane. She advised him that he was being placed under arrest for domestic assault and battery. Rather than speak with the police, Dunn requested access to an attorney. Born and raised in Sapulpa, Elizabeth has a Bachelor’s degree in American Studies and is a former banker. She is thrilled to be back in her hometown with her husband Michael and to be contributing to The Sapulpa Times. © 2015 Sapulpa Times. All rights reserved. Sapulpa Times is owned by Upward Media.